Cymbidium wadae outcross #3938 (approximately 15 seedlings per flask). The Species: First described in 2002, this species is from northern Thailand without location. It grows as a terrestrial and blooms in the spring. 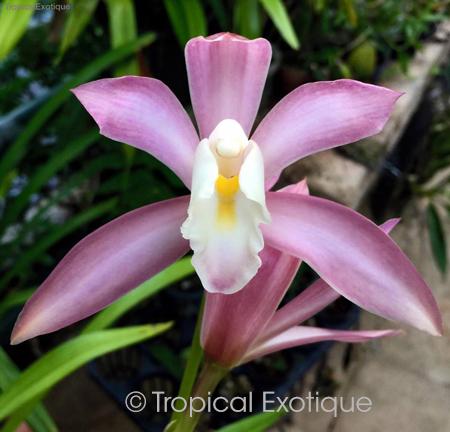 The growth is distinctly different from most Cymbidium species since it doesn't form pseudobulbs but rather the growth elongates over time, adding leaves at the top more like a monopodial. The original description says "It produces long-lasting, graceful flowers successively from the axils of the leaves towards the top of the stem." This makes for a space saving plant since it grows up and not out. The lightly fragrant flowers are a bit over 3" across with 1 to 2 per inflorescence. Culture: This is reportedly a cool growing species. Making assumptions from other species from northern Thailand, I would expect it to have a warm wet summer and a cooler, drier winter.